This super easy-to-make Italian dish yields some pretty amazing flavors, that it's hard to believe the recipe only calls for six ingredients and that it's all prepared in the microwave! This dish is cheesy, rich, and very addictive...so addictive in fact, that you may want to double up on the serving size. 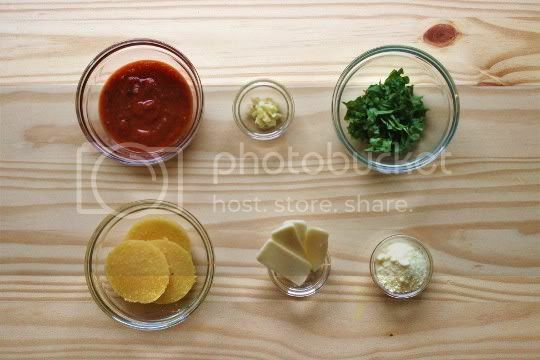 Start by heating up the prepared marinara sauce (make sure you use a good one) with fresh basil and chopped garlic. These two simple ingredients really do wonders for the sauce, and the garlic adds a spicy, raw pungent bite (since it's not actually cooked). Next, arrange slices of precooked polenta with slices of fontina (or another cheese of your choosing), and microwave until the cheese is melted. Top with the marinara, sprinkle with Parmesan, and you're done! OMG, this stuff is sooooo good. The flavors all work so well together: tangy, cheesy, salty...total comfort food. 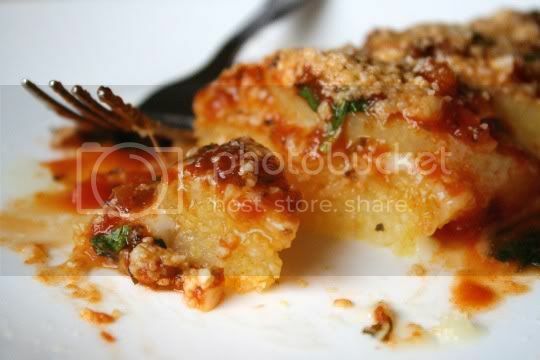 The polenta absorbs the marinara, which incorporates even more tomatoey flavor. One note about the cheese: fontina is naturally VERY salty, so yes, this dish was rather salty. I'd suggest using a mozzarella or other mild white cheese if the salt might be too much for you. Don't forget, the Parmesan adds more salt as well. One other note about the polenta. Because it's microwaved, it's really just being heated and not actually "cooked," so it ends up a bit mushy. Which is fine because, well, it's polenta. But for a dish like this (where you can experiment with creating a polenta "stack" if you wanna be fancy), I think it's best to saute the polenta slices in a little oil, just enough to achieve some browning and firmness. That's just a thought...or you can stay with the quick microwaveable route. They're both amazing; I tried both ways! Make again? Definitely. 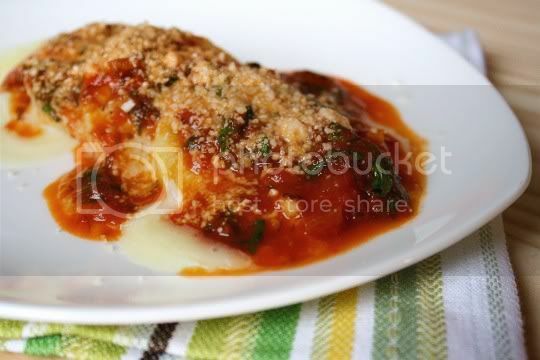 A great way to use up leftover polenta, and a great way to achieve yummy Italian in minutes! Vegan variation: Use vegan versions of mozzarella and Parmesan.